Saturday was a busy day for Michigan State Football. The team held their first Spring Game in East Lansing, where Green beat White 42-26. 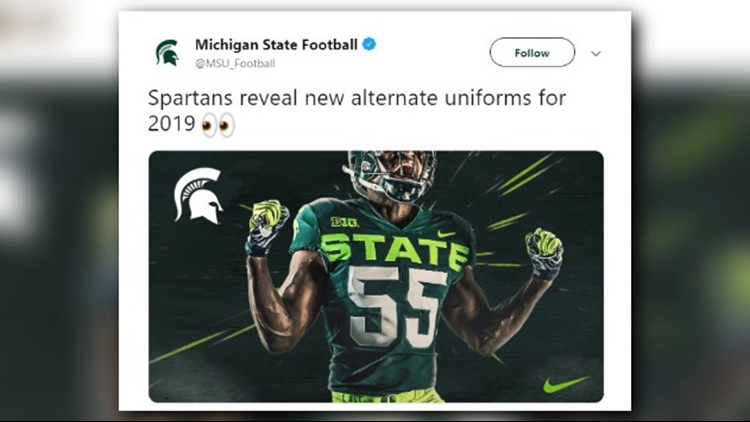 Michigan State Football also revealed the team's new alternate uniforms for the 2019 season. The uniform features lime green on the pants, on the gloves and with a big "State" written across the chest. The announcement was met with mixed reactions on social media. Khalid Hill, a University of Michigan football alumni who was released from the Seattle Seahawks, pointed out that the gloves in the photos had a Seahawks logo on them. The Detroit Free Press reports that MSU will have its own version of the gloves in the fall, but the customized ones were not ready when the uniform was photographed.